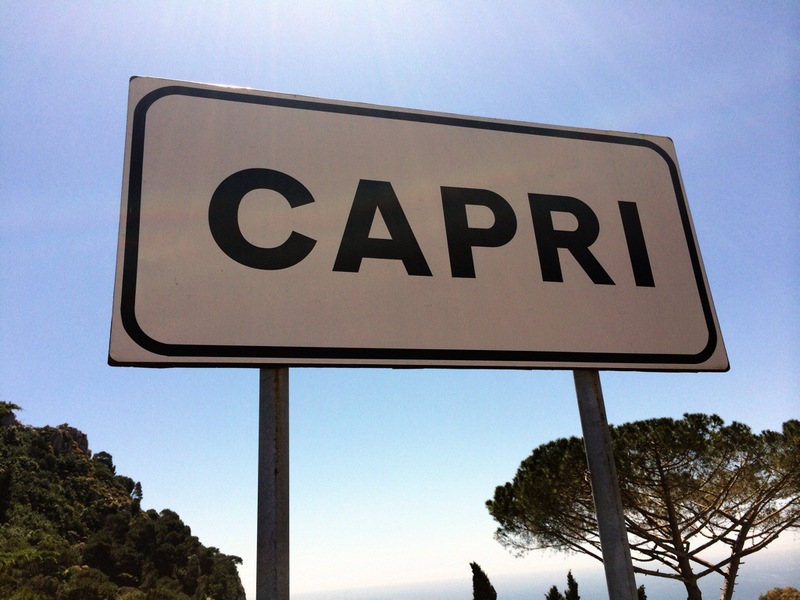 Capri is just a short 25 minute ferry ride from Sorrento. The infamous island lives up to its name. Capri is a major destination for every tourist in Italy. You just have to put on a brave face and power through. Dodging the crowds is well worth the visit. We decided that if we really wanted to see the island in one day, then we go by boat! We hired a small boat to take us on a 2-hour ride along the crystal clear water. We did feel fancy! Private boat with our own captain, come on!! I was in Heaven. 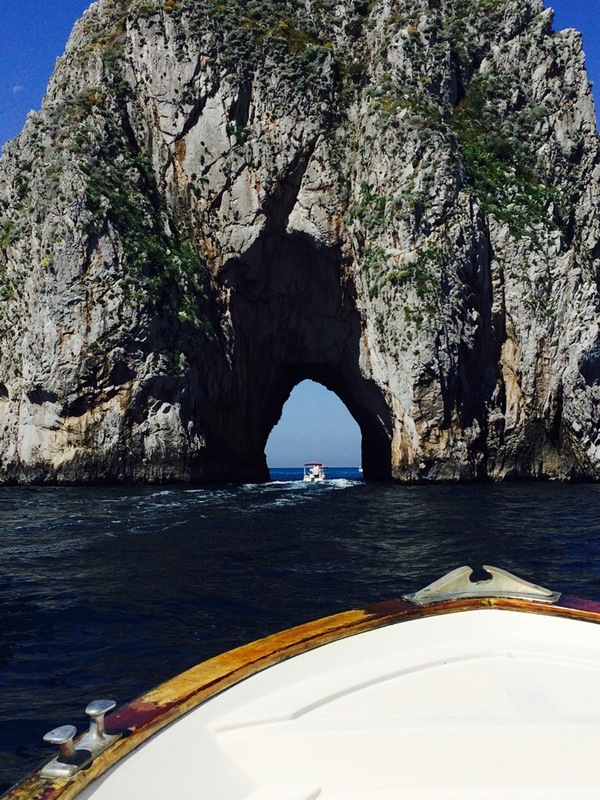 Our captain took us in the grottos and explained everything about the land of Capri. “A grotto is any type of natural cave that is associated with modern, historic, or prehistoric use by humans.” Basically a beautiful cave. He was born on the island and you could tell by the pride in his voice. He should be proud, the island is perfection. We found a perfect spot and decided to take the plunge. The water was freezing. But how many opportunities do you get to swim in the waters of Capri. Let’s just say we didn’t last long. There was a lot of squeals and screaming. We were back to cruising. We approached Faraglioni, the famous rock formations. He said the one rock that has a split in the middle is the love rock. He said we would drive our boat through it, and we should make a wish. I shut my eyes really tight and wished! Doesn’t everything wished in Italy come true? The blue grottos were next. You have to change boats to a small row boat to enter and lay back flat in the boat. This is so you won’t hit your head. Then magic! You are in a luminescent blue grotto cave! Such an amazing experience. We finish up our boat cruise and head to town. I always want to get to the center of each town and explore. I like to try and figure out where I am and go from there. Next we made our hike to the top. You turn around and even I was speechless. We just stood there and took it all in. We found one of the oldest churches and also a few beautiful museums. We next took the local bus to Anacapri. Anacapri is the only other town on the island. It is equally as fancy. It has more character. All of the Prada and Gucci’s are on the Capri side. Alyson and I split up for a bit and off I went to explore. I just wanted to catch the best view. And I did. Swedish psychiatrist and writer Axel Munthe. The Villa was build on the ruins of the Roman Emperor Tiberius‘s villa. It offers panoramic views over Capri. It didn’t even look real. 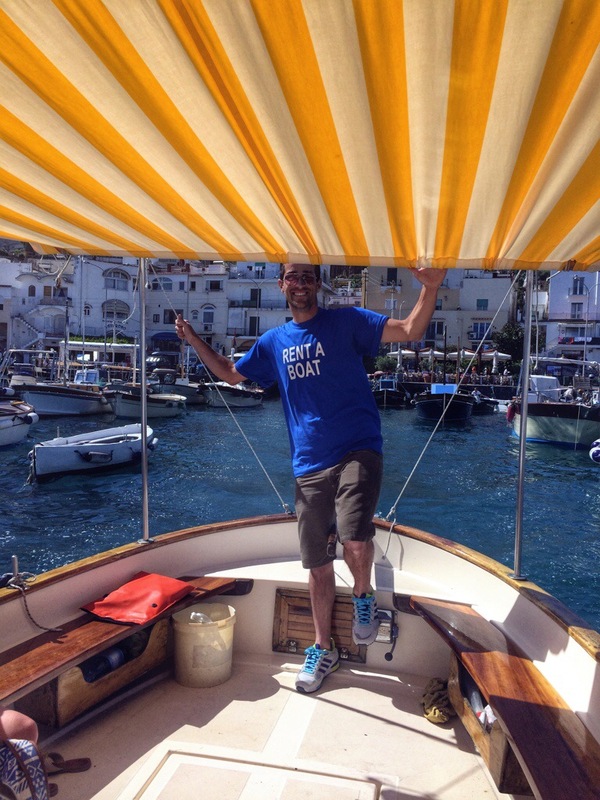 This moment is worth all the shoves and stress the crazy tourist cause to get to Capri. 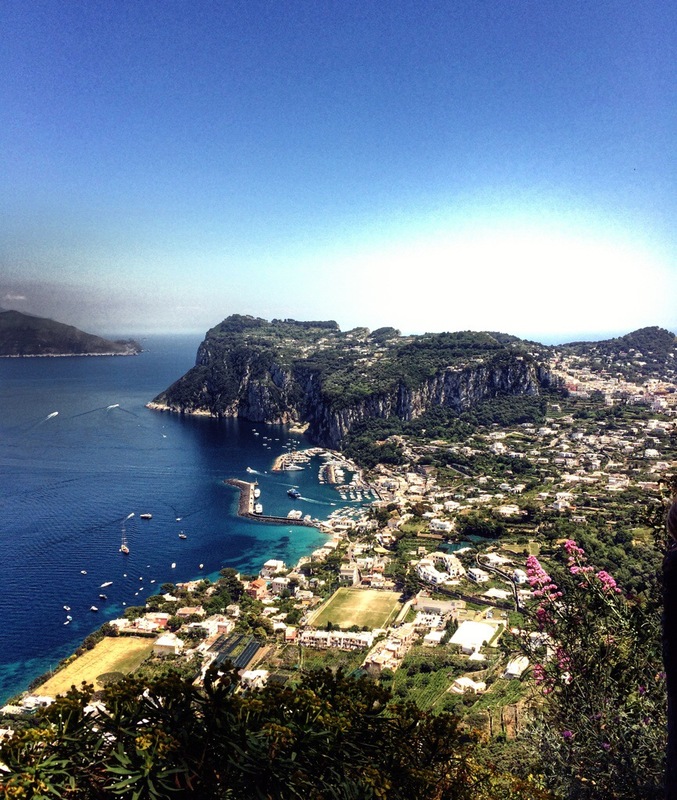 Capri is the perfect day trip. Now back to the main land. We are cooking dinner tonight! Lindsay, this is your long lost friend McKenzie. Lol I stumbled upon your website by complete accident and I have to say …I am loving it! I felt it only appropriate to say I remember when we first went to this beautiful island of Capri (spelling?) together in high school! I’m so happy I found you’re fun website! And I am so thrilled you’re still traveling. Oh man, now you are making me super jealous while I struggle studying for this darn statistics exam (FYI I am back in nursing school). Bali, was my last stop on that particular trip. I made my way from Beijing south … and ended up in Bali and then had to come home:( I will be back again though. I could totally live there. I haven’t looked at too much of the earthquake and tsunami news … and/or what islands were hit in Indonesia last week? I hope you are safe. I followed you on twitter, (I think I’m under McKenzie C. Cameron but it might still say McKenzie Carter). I’m looking forward to seeing more of this fun adventure your on! PS-My husband and I just moved back down south from New York, We are living in Beaufort for at least another 2 years. Keep in touch. I filled in my email so you should be able to imessage or email me using that. Let me know if you’re ever home for a visit for the holidays or whenever. I would love to catch up with my long lost munchkin! ← You got to have faith!